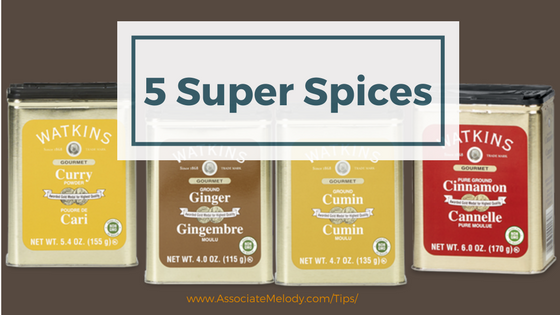 Have you heard of the five super spices for health and good taste? Well, it might improve your health by adding a little extra spice in your life! Spices are known to enhance the flavor of the foods we eat. But did you know eating them may also help improve your overall health? These five super spices: turmeric, coriander, cumin, cinnamon, and ginger; all have health benefits which may entice you to find new recipes to include them in your meal-planning repertoire. Cinnamon is a common spice that is used in cooking and baking around the world. It has been proven to be beneficial for those with diabetes as it may help to control blood sugar and regulate insulin. It is also believed to lower LDL cholesterol and triglyceride levels. It is an antibacterial, anti-fungal, and anti-inflammatory spice and has been proven to be helpful in preventing gout and some arthritis problems. This tasty spice contains manganese, fiber, calcium, and iron. Watkins is famous for its high-quality cinnamon. Cumin is common herb used in curry and Mexican food. It aids digestion and can help relieve insomnia, asthma, respiratory problems, and bronchitis. Breastfeeding mothers will also benefit from eating curry as it can help with lactation, as well as beefing up your immune system and helping to fight cancer. It is recognized as an anti-inflammatory, diuretic, and for its antispasmodic properties. 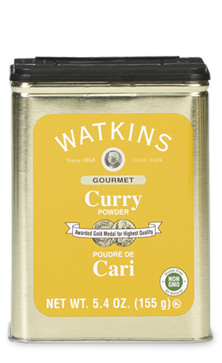 Purchase cumin on its own and in curry powder. Coriander and cilantro come from the same plant but from different parts, which makes it both an herb and a spice. Coriander is the seed and cilantro is the leaves and stems. You may recognize both of these as being used in Mexican, Mediterranean, and Middle Eastern cooking. They may help control blood sugar and lower cholesterol. They are also believed to help fight cancer and aid digestion. They contain manganese, magnesium, and iron as well as several essential oils which are good as an anti-diarrheal, antiseptic, and for reducing menstrual disorders. Ginger contains the phytonutrients gingerols and shogaols, which give ginger its flavor. Ginger is known to aid digestion, calm motion sickness, and is often called a pregnant woman’s best friend as it calms morning sickness. It is often used in Chinese medicine to combat rheumatoid arthritis and has been used to treat those suffering with migraine headaches, chronic pain, and muscle aches. Please note, however, that self-medicating with ginger is not recommended for those taking blood thinners or those suffering from gallstones. Learn more about the health benefits of ginger. Used primarily in Indian cooking, turmeric is a root that is dried and ground into a powder. Turmeric’s active ingredient curcurmin is currently being studied for possible health treatments for Alzheimers disease, pancreatic cancer, colorectal cancer, breast cancer, and liver disorders. Turmeric has been recognized for thousands of years as a safe anti-inflammatory product. Curcurmin is also believed to be a powerful pain reliever and is currently being studied for treatment of arthritis patients. The spice contains potassium, manganese, iron, and vitamins B6 and C. Tumeric is the spice in curry that makes it bright yellow. Wondering where to buy the best quality Super Spices? 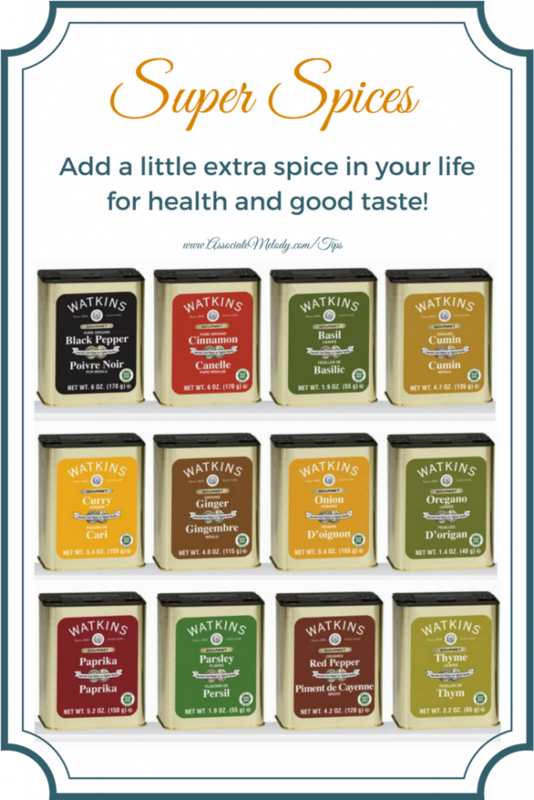 I love Watkins spices because of the outstanding quality and flavour! You’ll taste the difference too. Order your Watkins spices and other products in our safe, secure Watkins store, or request your free Watkins full product catalog and order by mail or phone. With Watkins, your satisfaction is always guaranteed or your money back! Be sure to do your research and check with your medical professional before you make a change in your diet. The Federal Food, Drug, and Cosmetic Act require the following statement: These statements have not been evaluated by the Food and Drug Administration. This product is not intended to diagnose, treat, cure, or prevent any disease. Cayenne Pepper Red Hot and Healthy!